Below are images of sacred geometry found in Europe and sent to us by friends around the world. This represents only a small percentage. Have you found something interesting? Send it to us for inclusion here! Here is a tombstone from Borje, one of nine "Goranic" villages in Albania, on the border with Kosovo. "Goranci" is a Slavic-speaking minority in a mostly Albanian region between Kosovo, Albania, and Macedonia. 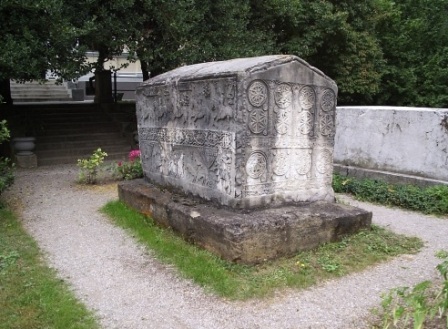 This tombstone is filled with detailed sacred geometry symbols as written about in the Bulgaria section below. The Flower of Life and the 5-petaled flower is also clearly depicted, along with a 5-petaled flower in what seems to be a polar-graph symbol. These tombstones are called Stecaks. They are the best known and the most valuable monuments of medieval art in Bosnia and Herzegovina. There are about 60,000 tombstones organized in a large necropolis all over Bosnia and Herzegovina. This photo is from Donje Zgosce Author Goran Radosevic. Click Here to go to the URL. Click on the image to the left to see a larger, more detailed photo. The photos to the right were taken by an anonymous friend, in the Federal State of Lower Austria in the town Weitra. They were taken in a medieval-like town in a castle. This FOL symbol was carved in wood and measured about half a meter (about 20 inches) in diameter. The tour guide mentioned the symbols were from a non-Catholic, or pre-Catholic source. The patterns survived a fire. The ceiling beams also contained carvings of the Seed of Life and the Flower of Life. As discussed in the Albania section, above, Bosnia and Herzegovina have the largest accumulation of stecaks. Stecaks purportedly began appearing around the second half of the 12th century. Here is a close up of Stecak Bosnia, Tombstone Zgošća (Kakanj) XV century, at the National Museum. Photo from Damir Nikšić. 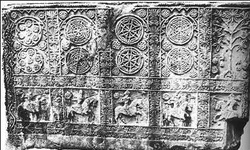 As with the stecak from Albania (above), the 5-petaled symbol can be found superimposed over a kind of polar graph. Click on the photo to left to see a larger version. Bulgaria is filled with sacred geometry symbols! 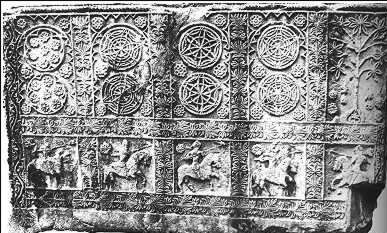 The slide show to the right depicts the FOL symbol - the 5-petaled flower was carved on a stone wall in the ancient city of Preslav (893 BC); the full Seed of Life pattern is made from mosaic tile in the ruins of Kabile, near the city of Jambol. 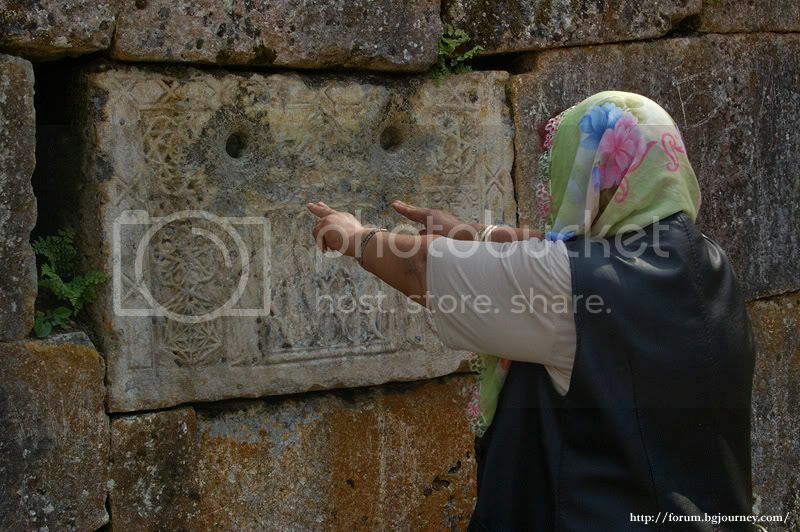 The slide show at left, with photos sent in by Georgi, is from North-East Bulgaria, with sacred geometry symbols such as the Flower of Life and the Metatron's Cube pattern found carved into the stone blocks of a wall. We have also included a line drawing of the Metatron's Cube pattern that was carved on the stone, to make its characteristics more clear. Click Here to see the original URL where the photos are stored. The Seed of Life pattern was painted in 1400 century. Photos taken by Carsten Cramon. Submitted to us by Ilona, from the Monastery of Preveli in Crete. Mila Lapteva submitted this photo from Pompei, taken by Nathan Kuch. We've received several photos from Pompei and this one is the best quality. The FOL pattern is shown on the floor. The photos to the left were taken by us during a workshop tour of Scotland in 2007. They were taken at the oldest church in the UK - St. Magnus Cathedral in Kirkwall, Orkney Islands. Here you see Ronald Holt showing the axis of the five-petaled flower. On the stone is also carved what they call a "crusader's sword and cross". They believe it is from the 13th century.